Among all the participating enterprises, Hongqi, the subsidiary brand of Chinese automobile brand FAW, made its debut at this year's show, marking another breakthrough for Chinese automobile brands. 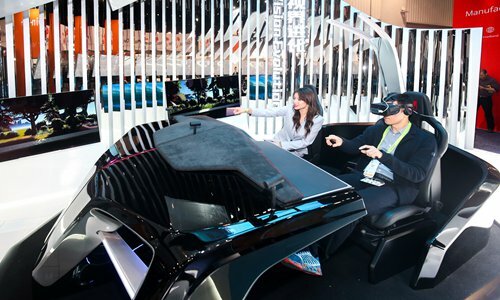 Instead of exhibiting an actual vehicle at the exhibition, Hongqi uses 21 screens of different sizes that hang from the ceiling to form an imaginary space, giving it a name called "QIJING," which means intelligent cabin. The 21 screens are divided into two layers. The outer layer displays the brand image, and the inner layer shows user experience. In the cabin, customers can enjoy a 5D (visual, auditory, olfactory, tactile and perceptual) travel experience. The debut of "QIJING" intelligent cabin results from a recently released plan by FAW Group Corporation Co., Ltd. - the R.FLAG Plan. FAW is a leading global manufacturer of quality passenger cars, trucks and buses. Established in 1953, the company is China's oldest and largest automotive group, and its subsidiary brand Hongqi is also the assigned automobile brand for state leaders and guests in many state events. FAW announced its R.FLAG Plan, a technology development plan for the Hongqi brand, in Shanghai on October 30, 2018. The R.FLAG Plan, stands for "Rise, Future, Leading, Autonomous and Genes," which is comprised of four strategic plans: i.RFlag, e.Rflag, 5f.Rflag, and m.Rflag that represent Hongqi's technology brand in intelligent connected vehicles, electrification, and user-experience and ride-sharing respectively. In the context of global competition, Hongqi shows its new look as the representative of one of China's leading innovative automobile enterprises and proves its resolution in innovative development and brand remodeling. FAW announced the release of the New Hongqi Brand Strategy on January 8, 2018, aiming to make Hongqi a "No.1 brand in China, famous worldwide." In the past year, the strategy has been smoothly implemented and has made great progress in many aspects, such as brand image building, 5G mobile travel, style design, product matrix, technology research and development, factory quality, service channels, and sales performance. Until December 14, 2018, Hongqi has made cumulative sales of 30,000 vehicles and finished their sales target ahead of schedule. Just like the rise of Huawei in the field of communication and technology, Chinese automobile brands also need to make breakthroughs and compete with international rivals. The debut of Hongqi automobile at the CES is a reflection of the trend. In the process of becoming more influential worldwide, Hongqi will also lead other Chinese automobile brands to a new level. Owned and produced by the Consumer Technology Association (CTA), the CES is the world's gathering place for all those who thrive on the business of consumer technologies, which attracts the world's business leaders and pioneering thinkers. The first CES took place in New York on June 24, 1967. This year's show takes up an exhibition area of more than 255,000 square meters and attracts nearly 4,500 companies as well as over 180,000 participants.